With the fantastic prices you find at Specsavers, and their 2 for 1, you can afford a choice – be bold or demure – or both! The prescription frames new designs for the new season fall trends: retro, red, purple + grey, green and blue, with frames to cater for most spec wearers out there. For sunglasses, cat-eyes, Onassis, oversized round (for women), aviator and wayfarer shapes, and chunky (for men) are at the top of Specsavers new Wall of Sun – and area with prescription sunglasses from only £69 and counting with various designers like Tommy Hilfiger, Cheap Monday, Red or Dead, Boss Orange and Osiris. Launches included lines from Red or Dead, Firetrap, Cheap Monday, Gok Wan, Roxy and Quicksilver. Amongst a sea of beautiful frames, I have to say that the one that caught my eyes (literally), was the Red or Dead Mad in England. All the quirkiness of Red or Dead encapsulated in one four-way pair of spectacles: my all-time favourite shape, the cat-eye with three pairs of interchangeable “brows”, in bright red, art-deco black and gold marble. Also, I fell in love with the brand, as everyone there from Red or Dead was sooooo lovely! And this beauty will be available on the 2 for 1 offer from April, for £99, inclusive of Pentax lenses. How amazing is that? Other frame designs are equally lovely – I could easily get three or four pairs. And that’s without counting sunglasses! Check out the Red or Dead glasses at Specsavers. Gok Wan (who was there himself), is the Specsavers style ambassador and had his fabulous range of specs displayed. A mix of classic and quirky, you are certain to find a pair for you within his GW range of frames exclusively for Specsavers. The new frames have amazing colours! Cheap Monday is a Swedish fashion label that recently landed a partnership with Specsavers. They very unique and urban, and their glasses play with classic shapes but with different textures, colours and materials. The glasses seem quite unisex in general, but they do have a male and female lines. On top of the very cool glasses and sunglasses designs, the guys from Cheap Monday are so nice and enthusiastic that would be impossible not to like the brand. Firetrap had a showcase of their breadth of products – glasses, shoes, accessories and clothing. Their frames are classic in shape and materials, with an urban edge and a pop of colour, taking inspiration from industrial lines and rock’n’roll. But what really jumped at me was some of their clothing for SS14 – lovely prints, cute details and reshaping of classics, like denim shorts. Thumbs up. Roxy and Quicksilver have a line of glasses designed especially for Specsavers. They have a really strong focus on the material quality. Roxy’s glasses play with colours (contrasting colours on the inside of the frame) and patterns, which are the same as on luggage and other accessories – and they also have 4 petite styles, catering for the brand’s young fans. Quicksilver frames are mainly steel and acetate plastic, to fit in with the brand’s adventurous beach and sports lifestyle. We also had the chance to talk to hairdresser Andrew Barton, who was talking about hair trends for the coming season – messy knots, low ponytails, effortless natural, slicked back and mixed textures were the main ones. He also had his styling products, sold exclusively at Asda. I have to say, Andrew is a sweetheart – and when he talked about briefing the smell of the products on his nan’s baking smell, I was all warm and fuzzy inside! He also has a line of stylers, available at Argos, with curlers and straighteners – all pink and girly! Together with Andrew Barton, fabulous celeb makeup artist Armand Beasley who talking about makeup trends – colour pop, 50’s flirt and kohl, amongst others. Very useful information and also personalised advise from a pros – you can;t beat that. There was also plenty of sparkling, airbrush tattoos from The Strawberry Studio and personalised graffiti on our Specsavers canvas bags – making this event a winner all around! You can check the Specsavers website for more details on new and existing ranges. 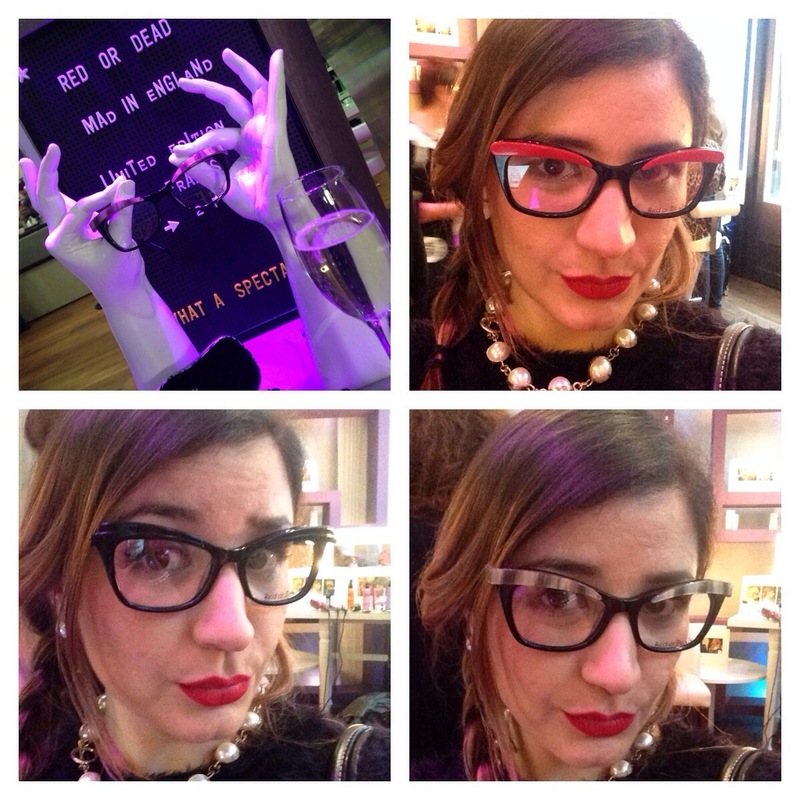 I got Osiris glasses from Specsavers before, loved the service – and am still in love with the frames! Most launches will be hitting the vast number of Specsavers branches in April and quite a few are on for £99 with Pentax lenses, on the “2 for 1” offer. Yeah, you heard it right. NO excuses not to have fabulous specs this summer! 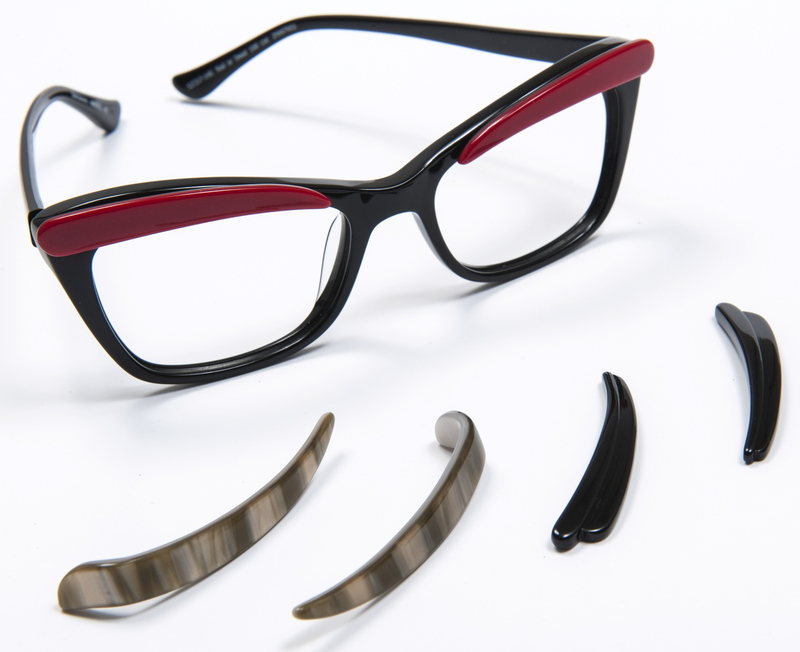 I am totally in love with the Red or Dead Mad in England eyeglasses with the three interchangeable eyebrows. I have been trying to get my hands on them, but it’s proving very difficult. I live in the United States, do you know where or how I can purchase them?